Screenplay: Josh Klausner, Darren Lemke. Voices: Mike Myers, Eddie Murphy, Cameron Diaz, Antonio Banderas, Julie Andrews, Jon Hamm, John Cleese, Walt Dohrn, Mary Kay Place, Conrad Vernon, Larry King. Everyone’s favourite rotund ogre returns in his final adventure in the land of Far Far Away, as Shrek goes fourth. 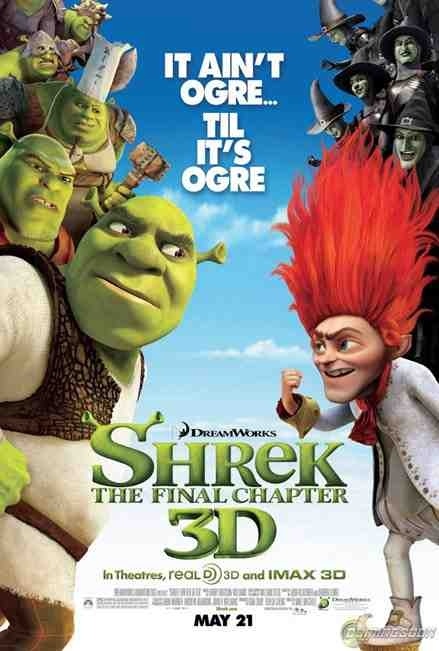 The story follows directly on from the third instalment where Shrek is now the married father of three little ogre’s. The problem being that Shrek doesn’t think he’s cut out for family life and starts to miss his previous life of being a swamp dwelling batchelor. It’s during this moment of reminiscence and weakness that he is approached by Rumpelstiltskin who seizes the opportunity to enter into a contract with Shrek, promising him his old life back. Unbeknownst to our green friend though, it changes everything and the land of Far Far Away becomes a dystopian land ruled by the tyrannical Mr. Stiltskin and everything Shrek had known, no longer exists. This being the case, the Shrekster has to set things right and enlist the help of his old and faithful friends. A welcome return to form for the franchise, following the disappointing “Shrek the Third”. It uses a clever narrative device in the vain of “It’s a Wonderful Life” and allows the story to fall into an alternate reality and change everything that has gone before and with this being the premise, the Shrek tale is given more room for manoeuvre. The fact that Shrek has to re-acquaint himself with old chums, Donkey, Puss in Boots and Fiona is refreshing and works a treat. The only problem with the story is that Shrek himself as a character, is a little flat this time around and it is left up to the ever reliable and hilarious Donkey and a now over indulgent and obese Puss in Boots to provide the laughs. They are both great, if a little underused, as is a newly developed and hardened Gingerbread Man. The introduction of the odious and impish Rumpelstiltskin is also a welcome villian, as well as his accomplice the Pied Piper. Back on form and as enjoyable as ever. It’s good to know that Shrek has went out on a high note. This entry was posted on January 14, 2012 at 9:05 pm and is filed under Animation, Comedy, Family with tags 2010. You can follow any responses to this entry through the RSS 2.0 feed. You can leave a response, or trackback from your own site.